Are Your Franchise Advertorials Making UnLawful Claims? Trade publication reaches out to a franchise brand or its PR firm offering to do a great article to promote your franchise to its readers. And those article points are essential to a branding story. However when the trade publication says our readers won't have any interest in your brand unless you give us some numbers to include in the article. Now this seems innocent enough, right? This is a legitimate trade news publication and they are just reporting. We all know in most trade publications there is not much separation between the sales and journalism side of the business. And it's pretty clear that you are paying in some way for this "positive franchise PR". And what does the intrepid CEO or franchise sales executive do about the numbers question? 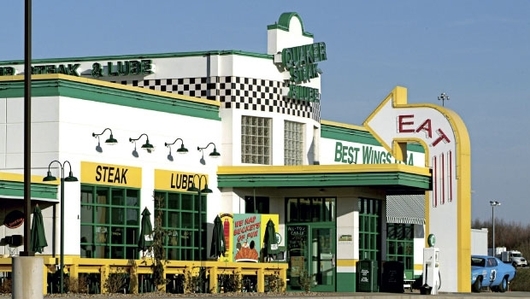 For example FSR Magazine has a great story on Quaker Steak & Lube that would be very enticing to franchise-buyers. However they talk about AUVs being $3.4 Million and "System-wide sales were $156 million in 2013, and are projected to be around $180 million this year". Quaker Steak & Lube's franchise sales team is going to want to use trade publication email blasts to potential franchise buyers and they are certainly distributing to franchise prospects and put the article prominently on their website. Any ambitious franchise seller would do this. Problem is that there's that pesky FTC Franchise Rule about making legal FPRs or what we used to call Earnings Claims. And the Quaker Steak & Lube FSR Magazine article isn't compliant to use by the franchisor for franchise sales. And it's too bad since Quaker Steak & Lube has an Item 19 that could have been the basis for a compliant FPR in the article with the correct disclaimer. But, their PR agency put them at risk, $10,000 or more per incident of a misleading advertising copy. For the 5 Most Fascinating Stories about Franchising a weekly report, click here & sign up.